Welp, the time has come to bid farewell to another great institution of the lost American cultural landscape. 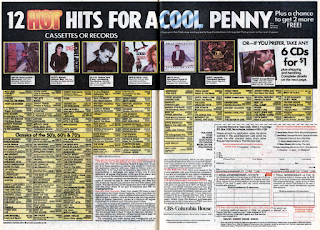 Yes, it’s time to say goodbye to the Columbia House Record Club. Actually, Columbia House Record Club ceased to exist ten years ago, when it merged with BMG. And they stopped selling mail-order music in 2009, so the ‘Record’ part of the club has been gone for some six years now. Still, the announcement earlier this month made me wistful. How I wish I could go back to a time when I could buy my record albums through the mail. You know, wait for one of those bimonthly club catalogs to come, make my selection, buy a stamp, send the order back, and then pay fifteen bucks for the privilege of waiting three weeks for the record to arrive. So much better than the way things are now, when you have to go online, choose your album from Amazon, pay for it with one click, and listen to it now. Actually, I learned a lot from The Columbia House Record Club. A lot about business. A lot about life. 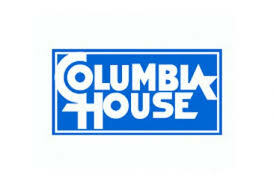 I’ve probably joined The Columbia House Record Company on a half-dozen different occasions between the years 1981-1991. Somehow, I always thought I could make it work to my advantage. And each time, I would fail miserably. See, already a business lesson. Make the customer think he can get a bargain, then soak him for every penny you can. It’s a tried-and-true business model, just ask any car dealer. I first joined the prestigious Columbia House Record Club with my older sister. We split a membership, but I wouldn’t tell that to the kids at school. “I’m a member,” I would say proudly, nodding meaningfully at the Members Only label on the person’s jacket. “Oh, yeah?” they would inevitably respond, wondering what this had to do with anything. “Oh,” they would say. Most would walk off after this, some pretty quickly. But if the person seemed impressionable, I would go on. Usually this would get their attention. “Oh, it is,” I would reply, trying not to look smug. “Yeah, but that’s not the best part. When I got my membership, I got to pick twelve albums, any ones I wanted that they had, and only had to pay for shipping and handling.” I was stretching the truth; I only got six albums, because as I said, my sister and I were splitting. But I felt safe saying it; it would be hard to prove since my sister went to a completely different school. “What? Columbia House? I don’t…” I would shake my head as if confused. “Yeah, well, where else are you going to get the official Broadway cast version of ‘Grease?’” I would snap back, my feelings suddenly hurt. Of course, they probably didn’t pay eighteen bucks for their copy of “Hi Infidelity” either. So that’s one of the lessons, the business law of averages. If a person buys twelve albums for twenty dollars shipping and handling (I’m guessing here, I don’t remember exactly what the charge was for that first shipment), and then that person buys eight more at eighteen bucks a pop (again an estimate, including shipping and handling), that person will spend an average of $8.2 per album. Still sounds like a good deal, right? But wait, there’s more! If you add in the cost of all the albums that person got because that person forgot to send the card back on time, the average goes up to about $13 (a conservative estimate, trust me). And $13 is greater than $10, which is what those same albums would have cost on sale at Target. Plus, I (I mean, that person) would have had albums that that person wanted to listen to. Speaking of those d*mned cards, I learned another valuable business lesson from Columbia House’s practice of sending you the album (and charging you full price for it) if they fail to receive your completed card by the deadline. From this I learned you can make a lot of money off people who are lazy, or forgetful, or both. Your customers may not like you very much, in fact they may curse you, gnash their teeth, and rend their garments with rage and frustration, but then again, this is business, right? Even when I was sure I sent the card in with time to spare, I still sometimes ended up with another unwanted album. As time went on, I started to question how they defined each part of the process of “receiving your completed card by the deadline.” Did ‘receive’ mean the day your card was delivered to the Columbia House warehouse, or was it only considered ‘received’ when some dude who only works a half-shift every other Tuesday saw it? And if you forgot to dot the abbreviation Rd. of your address on your card, was that card regarded as incomplete? And by ‘deadline,’ did they mean the deadline printed on the card, or did ‘deadline’ refer to the some other deadline, for instance the one used for filing the previous year’s taxes? Oh, and by the way, there was no way to argue with them, because you could never be one hundred percent sure that your card did in fact make it to the necessary place by the necessary time. Advantage: Columbia House. Well-played, my friend. Another little lesson I learned from Columbia House is that you really have to know what it is that you are buying before you buy it. 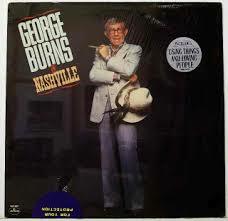 I once ordered an album called “George Burns in Nashville.” I thought it was a comedy album. Who knew George Burns had a short-lived career as a country artist? 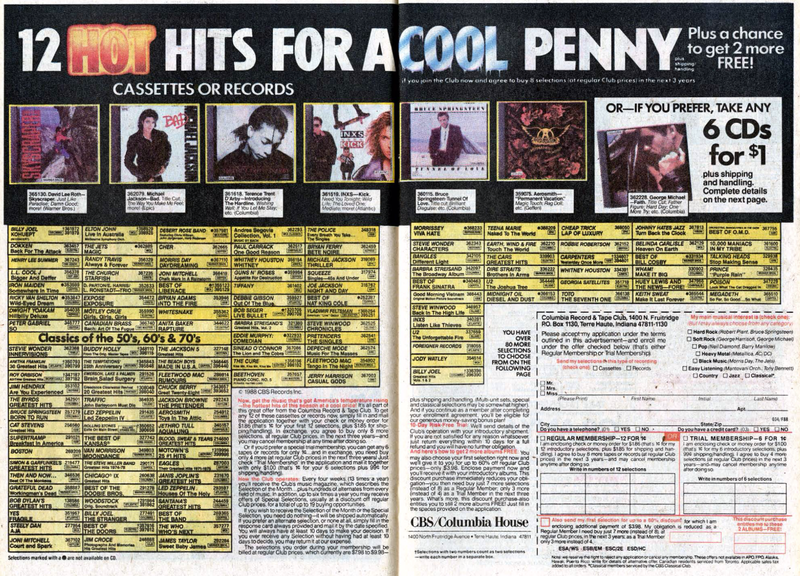 One more thing Columbia House liked to do was have sales. Buy one, get two free! Buy one at half-price, get another for half-price, stuff like that. Which sounds great, and really generous, but by the time you add in the shipping and handling, you save maybe a few bucks. Why did shipping and handling always cost so much anyway? What exactly was ‘handling?’ I get the shipping part: that’s the cost of preparing and mailing your records. But handling? What is that? At those prices, you’d think they were handling live venomous reptiles, like boomslangs and puff adders. One other thing about those sales. Because it was a special deal, the records you bought didn’t count towards your album purchase requirement. So nanny-nanny-boo-boo to you. Yes, I’ve learned a lot about business from the good ol’ Columbia House Record Club. It’s a shame that the kids of today’s generation will never have the same opportunity to get ripped off over and over the way kids in my day were. They may never get the chance to see how devious and underhanded money-grubbing companies can be. Wait, what am I saying? Kids these days still buy cars, don’t they?